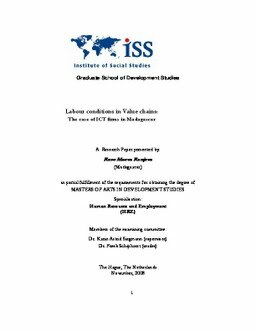 This paper analyzes the potential effects of insertion in value chains, gender, firm’s skill intensity and the skill level of an occupation on labour conditions in Malagasy ICT firms. The results indicate insertion does affect the atmosphere within firms, access to a good health insurance and safety rules. But it appears other items defining labour conditions do not depend only on insertion in value chains. Gender, firms’ skill intensity and the skill level of an occupation combined with the insertion factor also have an impact on labour conditions in these firms. Relevance to Development Studies: Madagascar is a very poor country and the lack of decent work is one of the restrictions to its development. This paper aims to analyze the labour conditions in a new sector in the country. This new sector, ICT, has triggered a lot of expectations because Malagasy people hope it will contribute to the development of the country. This research is especially concerned with an important aspect: labour conditions which is a real challenge for the development of the country.